Keeps papers from slipping forward. Extra- deep to hold 150 sheets of paper in place. Ideal for holding a full day's work of reference documents. Strong, fully adjustable clip holds documents from landscape to legal securely. Accommodates thicknesses up to 150 sheets. Folds up for convenient storage and easily - freeing up valuable space during other tasks. 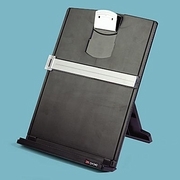 Non-slip feet keep document holder from sliding. · Accomodates up to 150 sheets or 1.5 Ib. · Now available in Black only. Source documents should be positioned no more than 35 degrees to either side of your monitor to avoid excessive turning or bending of your neck while you keyboard.